Term 1 has come to a close and it was been a very busy end of the term - 4yo official photos were been taken, dinosaur bones visited and the 3yos are now all settled in. Thanks to Megan and her wonderful social-fundraising team, who have been working hard to organise the Easter Fundraisers of Hot Cross Buns and Easter Eggs. Megan and her team have created our very own Eastmont Egg Fundraising Bags for people to sell and they look amazing! Don’t forgot to order any bulbs with our Tesselaar Fundraising before 12th April. Recently Angie, one of the Possum educators, was offered a full time position at her other kinder. We wish her all the best in the future. Nithi will be now assisting with the 4 year olds on Friday. Our Working Bee for Term 2 will be held on Sunday 28th April at 9am (so the first Sunday of Term 2). Follow the link (volunteersignup.org/XLJA3) to sign up if you can come along. 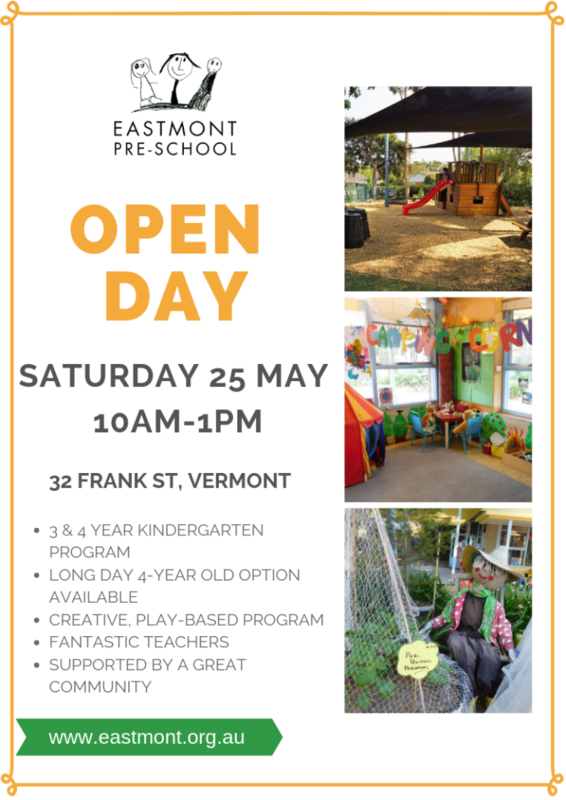 Our Open Day will be held on Saturday 25th May from 10am– 1pm. This is a fantastic opportunity for prospective families to come and see how wonderful our kinder is. Please spread the word. Flyer attached. A Mother’s Day event and the Annual Kids Movie Night, the most exciting evening of the kinder social calendar, will be happening next term. More information coming soon about both these events. I hope everyone has a lovely and safe Easter Break! The children are all settling in well and are learning each other’s names and the names of the staff. 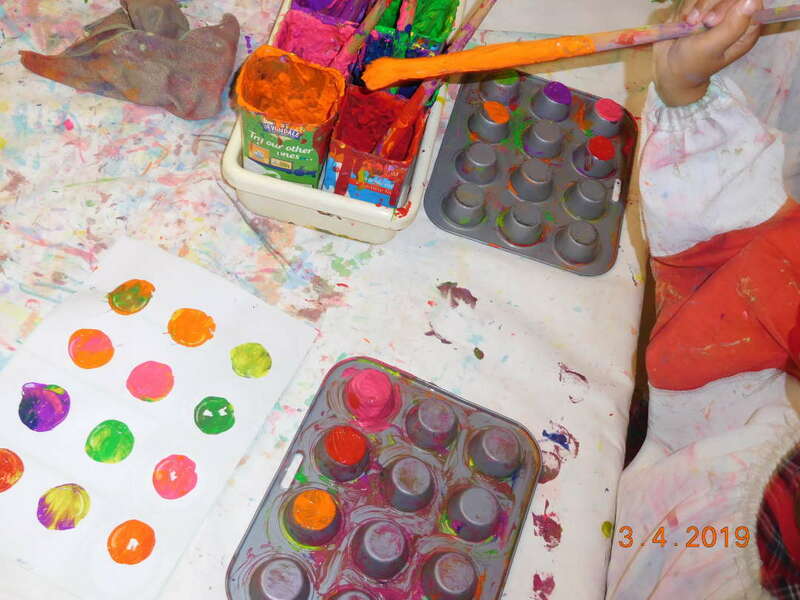 Over the last few weeks the children have enjoyed lots of fun learning experiences including playing with shaving foam and food dye, finger painting and threading using straws, patty pans and pasta to make large colourful decorations and necklaces. There has also been lots of dancing and singing. The children have enjoyed dancing with partners to Knees up Mother Brown and the Mexican Hat Dance. We have also introduced yoga and creative dance drama to the curriculum. 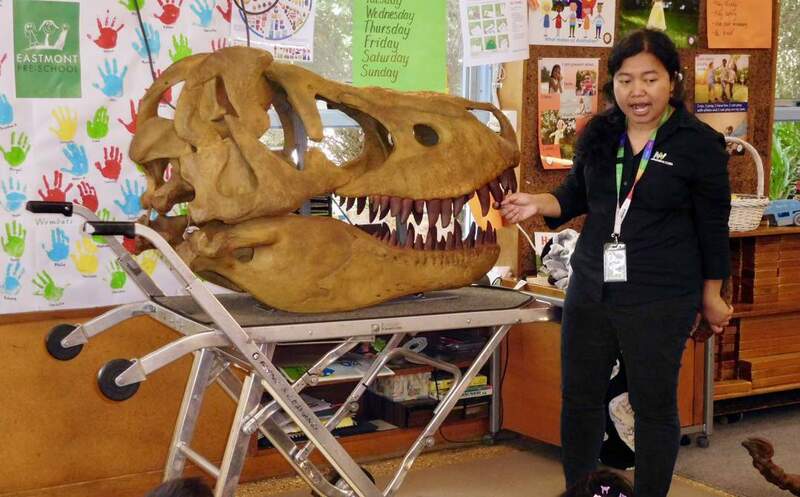 On 21st and 22nd March, Melbourne Museum visited with their Dinosaur Bones incursion. The children were able to see and touch huge replica bones and an enormous skull. There were also real fossils that the children were able touch and hold. Last week we made mosaic pictures with coloured tissue paper squares and printing using paint and muffin tins. There will be incursions for the 4yo groups on Monday 6th and Wednesday 8th May. 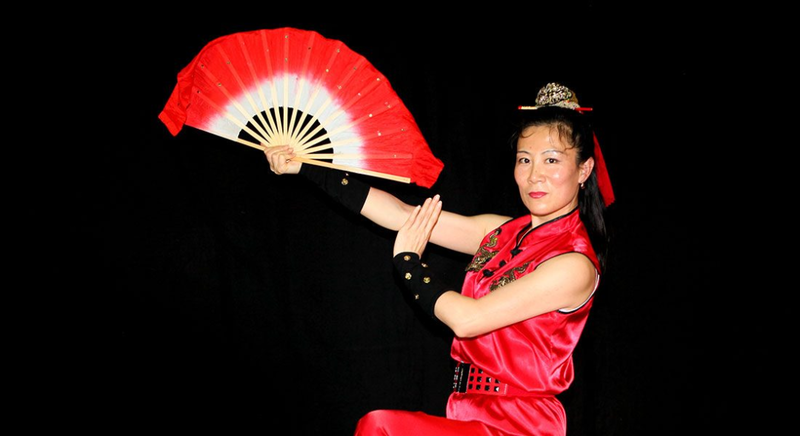 Cindy will be performing traditional Chinese Mulan Fan dancing and Kung Fu. The children will be learning about Chinese history and culture and will have opportunities to participate and try on costumes. 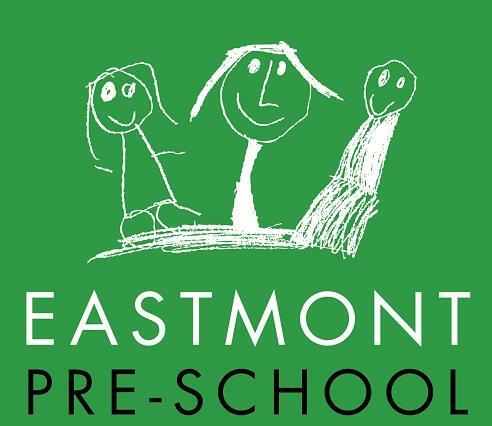 A dental team from Carrington Health will be attending Eastmont on Wednesday 15th and Thursday 16th of May to talk with the children about dental health and conduct free checks of children’s teeth. Permission forms will be placed in pockets early next term. We have four vacancies in the Wombats Group. 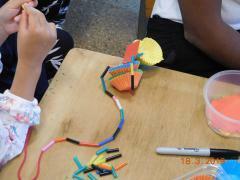 The program over the last month has been based around tactile experiences - for the children to experience different mediums to explore. We have had water pouring and then moved to flour with glitter, to pour, to sprinkle and sift. The experience encompasses, turn taking, sharing and to have language and interactions occurring between individuals incidentally. We will continue on with additions of buttons, to pour, pick up with tweezers and place in jars, to develop their fine motor coordination. Painting, pasting and sticker drawing has been used a great deal by the children and is an are that the children feel comfortable and confident. Outdoor play has shown the children transitioning from the sandpit and swings, to engaging in other areas, climbing frames etc. Now the children are familiar with educators they are requesting assistance over large frames etc. This is excellent, as the children feel confident to relate to us for help and are also willing to attempt new experience of high climbing. Songs on the mat are varied, but repetitive and now the children are confident to sing along and partake. The emphasis has been on number songs up to five, so that the children can feel confident counting to this number and then also going backwards. The songs are 5 little ducks, 5 fat sausages, 5 cheeky monkeys, Here is the beehive, 5 in the bed. Next term we will incorporate role playing these songs as the children are confident with mat time experience. Well that term vanished quickly didn’t it? It has been a good term with a few Social and fundraising activities. The Welcome BBQ in March had an amazing turn out and I know that everyone I spoke to had a great time. It was a lovely evening and the BBQ run like clockwork - thank you Charles for doing such a great job cooking the sausages. The sweet treats were a hit with the children and it was great to see so many people chatting and getting to know each other. Thank you to my subcommittee and members of the committee who supplied sweet treats and and helped out on the evening . I couldn’t have done it without you! Hopefully everyone is selling lots of Eastmont Eggs leading up to Easter - they sure where packed with love after Cadbury’s let us down! Thank you to my subcommittee members and Cassie and Mel who helped me pull off the massive task of getting 58 bags filled with 20 smaller bags and distributed to families. Let's just say I don't want to see another Easter egg for a very long time!! 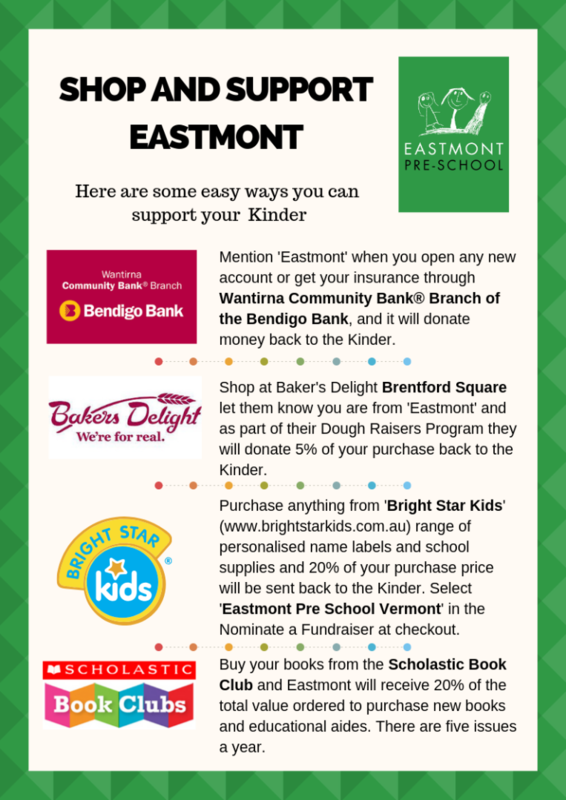 We have a number of exciting social and fundraising events coming up in Term 2 . First will be the ever popular picture plates, there will be one session held at the kinder for those that want to finish there beautiful artwork at Kinder or you can take a template home to complete at home and return. There are the usual plates plus a few other templates available. Keep your eyes out for more details in the children’s pockets on return to Kinder. Issue 3 Scholastic book orders will be available early Term 2. The teachers will also be starting to collect the children’s self portraits for the tea towels which will be sold later in year. 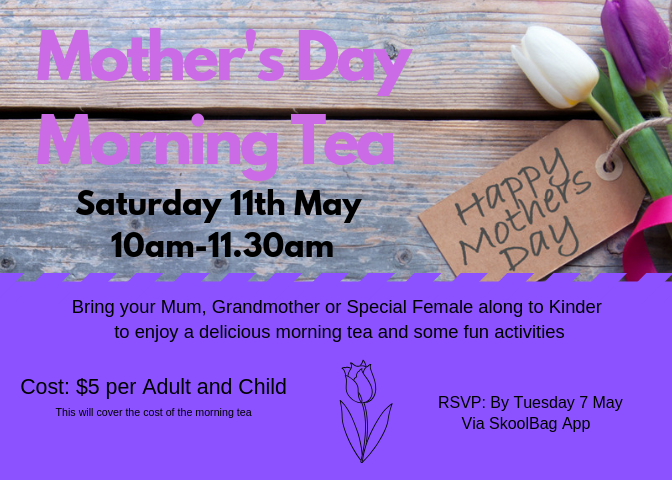 Another exciting and new social activity for this year will be a Mother's Day Morning Tea at the kinder on Saturday 11 May, where the children can bring along their Mums, Grandmothers or a special female in their lives for some fun activities and a delicious morning tea of scones, jam and cream. See flyer attached for more details. Renee Blight is busy organising a Parents Social Night for Friday 17th May…so keep the date free, further information to follow. Another popular event coming up next term is the Kids Movie Night on Friday 14th June. More information to follow shortly. Wishing everyone a safe happy Easter….don’t eat too much chocolate!!! 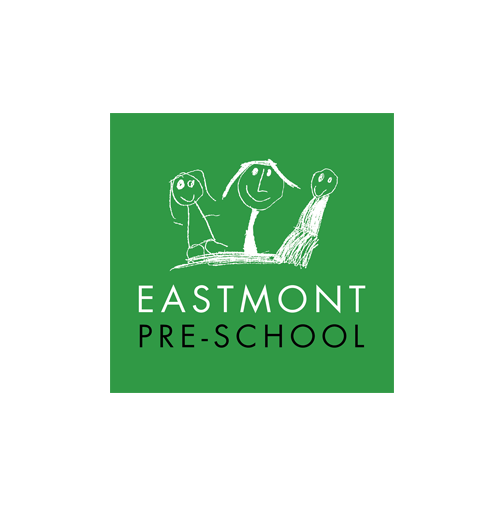 At Eastmont Pre-School we offer a play-based, child centred-curriculum that is guided by the Victorian Early Years Learning and Development Framework and the Early Years Learning Framework. Click here to read more about the Eastmont Philosophy.